As you settle in for the Super Bowl this weekend, be your own champion with these healthy and hearty bowl recipes. 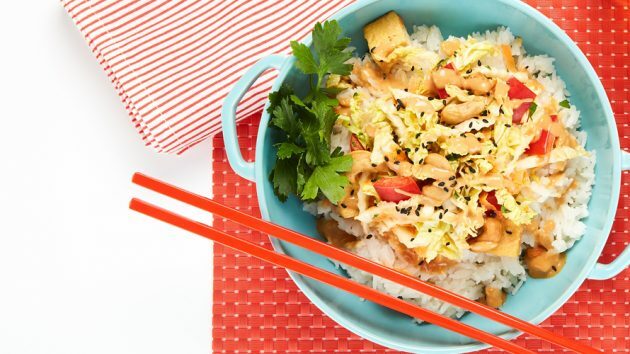 We can’t put down our chopsticks with this tasty number—with a delectable ginger peanut sauce, this Coconut Rice Bowl with Ginger and Tofu Slaw makes for a mouthwatering meal. 1) For the coconut rice, in a medium saucepan, combine rice, coconut milk, water and salt. Bring to a boil, stir, cover and reduce heat to low. Cook for 15 minutes, remove from heat and let sit for 5 minutes covered. Set aside. 2) For the ginger peanut sauce, using a blender, combine peanut butter, water, rice vinegar, soy sauce, honey, ginger and Sriracha sauce. Blend until smooth, set aside. 3) To prepare the tofu, cut the tofu into 1-inch cubes and lay on paper towel to absorb excess moisture. Heat vegetable oil in a medium skillet over medium-high heat. Sauté the tofu for 2-3 minutes on each side to lightly sear the outside. Remove from heat and set aside. 4) In a large bowl, combine napa cabbage, carrots, red peppers, chopped cashews and parsley. Toss with ½ cup of ginger peanut sauce and cooked tofu. 5) To serve, place a large scoop of coconut rice in each serving bowl, drizzle with ginger peanut sauce, top with tofu slaw and garnish with whole cashews and sesame seeds. Drizzle each serving with sauce as desired. Ready to be bowled over? Check out this incredible Japanese-style Teriyaki Salmon Rice Bowl, an easy, healthy and extremely tasty meal. The homemade teriyaki sauce (it’s easy, we promise) is lustrous and lends a sweet and tangy glaze to the tender roasted salmon. 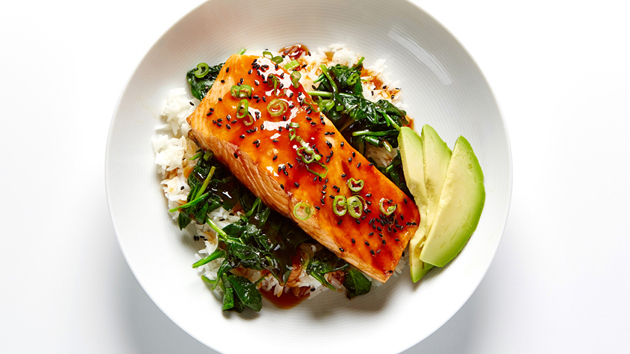 Paired with sautéed spinach and creamy avocado, this hearty-yet-healthy salmon is superb. 1) For the teriyaki sauce, in a small bowl, whisk soy sauce, mirin, sake and honey. In another small bowl, combine cornstarch and water and mix until smooth. Set aside. Remove 3 tbsp of soy mixture for marinating salmon. Pour remaining soy mixture in a small saucepan. Bring to a boil over medium heat. Whisk in cornstarch mixture and continuously whisk until desired thickness, about 2 minutes. 2) Place salmon fillets in a large reusable plastic bag and add reserved 3 tbsp of soy mixture. Set aside to marinate for 30 minutes. 3) Preheat oven to 400ºF and line a baking sheet with parchment paper. Remove salmon from marinade and place on prepared baking sheet. Bake for 10 minutes, remove from oven and brush the top of each salmon fillet with a generous amount of teriyaki sauce. Return to oven and bake 3-5 minutes more until fish flakes easily. Remove from oven. 4) While the fish cooks, in a large skillet, heat olive oil over medium-high heat. Add spinach, salt and pepper and toss to coat with olive oil. Cover and cook for 1 minute, uncover, turn heat to high and cook 1 minute more while continuously stirring. Remove from heat. 5) To assemble bowls, place cooked rice in the bottom of each bowl. Divide sautéed spinach between the 4 bowls and lay salmon over spinach. Garnish each bowl with a few slices of avocado, a sprinkling of sesame seeds and green onions. Drizzle remaining teriyaki sauce over finished bowls. Forget Spam, poi and pineapple. 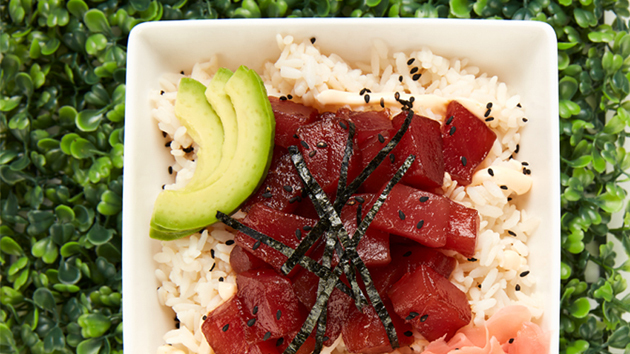 Poké (pronounced poh-kay) is a Hawaiian staple that is quickly making its way to the mainland. While traditionally made using ahi tuna, mainland Pokérias (no, not a real word but sure to catch on) are chopping up octopus, salmon and scallops as well. The fish is marinated in soy sauce and sesame oil and then can be tossed with everything from green and white onions, edamame and wasabi to sesame seeds, macadamia nuts and jalapenos. Poké can be served with tortilla chips, piled atop a bowl of rice, noodles or kale, or simply snacked on with a spoon. 1) Place cubed tuna in a medium bowl. In another bowl, combine soy sauce, rice vinegar, wasabi paste and sesame oil. Pour over tuna and let marinate for 5 minutes. 2) For the spicy sauce, mix together mayonnaise and Sriracha. Place in a small baggie and cut the corner so you can squeeze a small amount of the spicy sauce on the rice. 3) Divide rice between 2-3 bowls. Top with small amount of spicy sauce. Lay tuna on top and finish with seaweed, avocado, pickled ginger and sesame seeds. 1) To make the dressing, in a small bowl whisk olive oil, apple cider vinegar, maple syrup, Dijon mustard, shallots, salt and pepper until well combined. Set aside. 2)Preheat oven to 425°F. In a mixing bowl toss together cubed sweet potato, olive oil, salt and pepper. Place sweet potato on a parchment-lined baking sheet and roast 16-18 minutes, until potatoes are tender. Remove from oven and set aside. 3)Meanwhile, in a medium saucepan, combine quinoa, water and salt. Bring to a boil over high heat. Reduce heat to a simmer, cover and cook 12-15 minutes, until the liquid is absorbed. Remove from heat and let sit covered for 5 minutes. Combine quinoa, roasted sweet potatoes, avocado and a few spoons of dressing. Divide between 4 serving bowls, top with almonds and drizzle with more dressing. 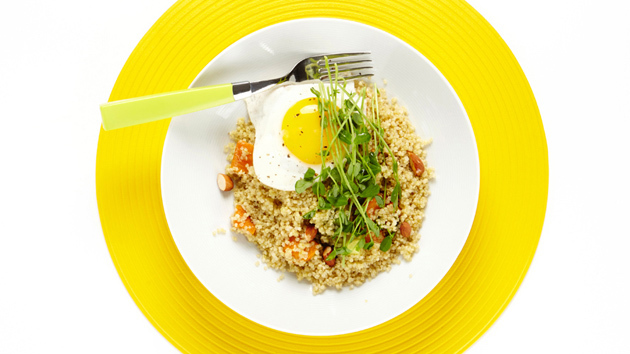 4)Finish each bowl with a fried egg placed on top and sprouts to garnish. 1) In a large soup pot, heat olive oil over medium heat. Add onions and season with chili powder, oregano, cumin, salt and pepper. Cook until onion is tender, about 5 minutes. Add red peppers, mushrooms, carrots, minced garlic and chopped green chili peppers. Cook another 5 minutes, stirring occasionally. Stir in diced tomatoes, black beans, chickpeas, kidney beans, salsa, vegetable broth, couscous, cocoa powder, brown sugar and cayenne pepper. 2) Bring to a boil over high heat. Reduce heat to low, cover and simmer gently covered for 40 minutes, stirring occasionally. Add corn and serve in bowls, topped with shredded cheese. 1) Preheat oven to 400°F. Coat 2 mini-muffin tins with non-stick cooking spray. 2) Place thawed corn kernels on a plate. Pat dry and set aside. 3) In a large bowl, combine flour, cornmeal, baking powder, salt and cayenne pepper. 4) In a small bowl, whisk together melted butter, sugar, honey, egg, vanilla and buttermilk. 5) Add butter mixture, roasted red peppers and corn kernels to dry ingredients. Stir gently to combine, just until flour disappears. Spoon batter into prepared muffin cups, filling to the top. Bake for 10 minutes. Cool for 5 minutes before removing from tin to a wire rack. 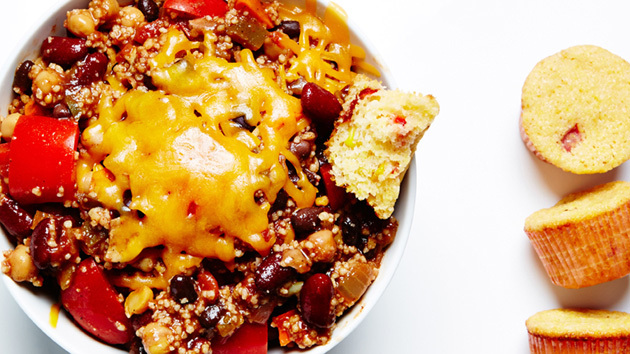 Serve alongside chili. Training to become a sushi chef can take up to 43,800 hours. 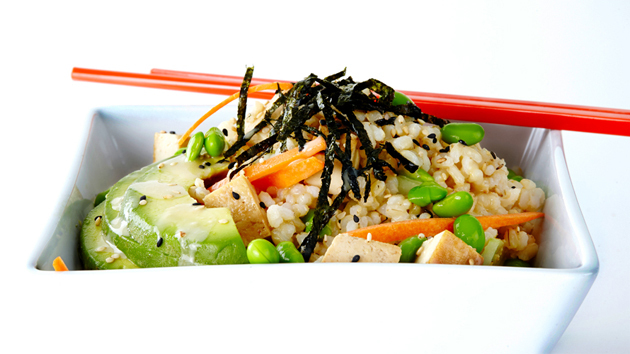 Making this delicious Sushi Salad of brown rice, marinated tofu, avocado and edamame, all tossed in a ginger wasabi dressing will take you less than 1 hour. We don’t know about you, but we aren’t going to roll our sushi…we’re going to bowl it. 1) Place tofu in a medium bowl and toss with soy sauce, mirin, ginger and sesame oil. Set aside to marinate for 30 minutes. 2) For the rice, in a fine-mesh strainer, rinse the rice until the water runs clear. Combine rice and water in a medium saucepan. Bring to a simmer, then cover and cook over low heat for 40 minutes. Remove from heat and let steam covered for 5 minutes. Spread rice on a baking sheet. In a small bowl whisk rice vinegar, sugar and soy sauce sprinkle vinegar mixture over the rice let cool. 3) Preheat oven to 400ºF. Line a baking sheet with parchment paper and place tofu in a single layer. Bake for 10 minutes, turn tofu and continue to bake 5 minutes more until golden. Remove from oven and set aside. 4) For the Ginger Wasabi dressing, using a blender, combine rice vinegar, mayonnaise, peanut oil, soy sauce, wasabi paste, honey and ginger until well combined. 5) To assemble salad, using 6 individual serving bowls, place rice in the bottom of each. Add tofu, cucumber, carrots, edamame and avocado. Generously drizzle each bowl with dressing and sprinkle with sesame seeds and nori strips to garnish.